The other day, I got a question from Cathy (a listener of my podcast). She had a series of pickling questions that came up when she was making my recipe for refrigerator pickles. And they were GREAT questions! So I did my best to give her great answers by recording an entire podcast episode on the topic. But if you would rather read than listen to the Q & A, fear not! Below, I have summarized each question and my answer – It’s all here. And if you would rather listen or read the full transcript of that podcast episode, I’ve got you covered there too. You can go to my Pickling Questions Podcast Episode for that. So here are Cathy’s Q’s and my A’s below. What is a Refrigerator Pickle? A refrigerator pickle is a quick pickle (not fermented) that is not canned or processed to go on the pantry shelf. Instead, it is made up and stored in the refrigerator. Other quick pickles ARE canned and stored on the pantry shelf. But a refrigerator pickle is not. It is a great way to beat the heat and NOT break out the canner. You can have your crisp delicious pickle in the refrigerator and avoid steaming up your kitchen by processing it. What should you do if you are short on brine? There are two options on how to handle this situation. Which one you choose depends on how much brine you’re short. Short by just a few tablespoons? However, always keep in mind that when you do add vinegar it’s going to make it more sour. So you will alter the taste a bit. But if we are only talking a few tablespoons, you should be totally fine. Short by MORE than a few tablespoons? The second approach is for when you need much more brine than just a few tablespoons. In this case, simply take the recipe and mix up another batch of brine. I know. So, just mix up a half batch. Since you will only be adding a cup or so of brine to your over all project, you can skip the flavorings if you wish. And by flavorings, I mean the dill or peppercorns or other spices that might be in your particular recipe. Because you are only added a small amount of brine, skipping the spices probably won’t make a difference at all to your overall recipe. If your recipe calls out any of those 4 elements, leave them ALL in your 1/2 batch mixture. Those four items are important for either the safety and/or the overall flavor/texture of your finished pickle. So when mixing up a half batch to top off your jars…keep those ratios exactly the same. 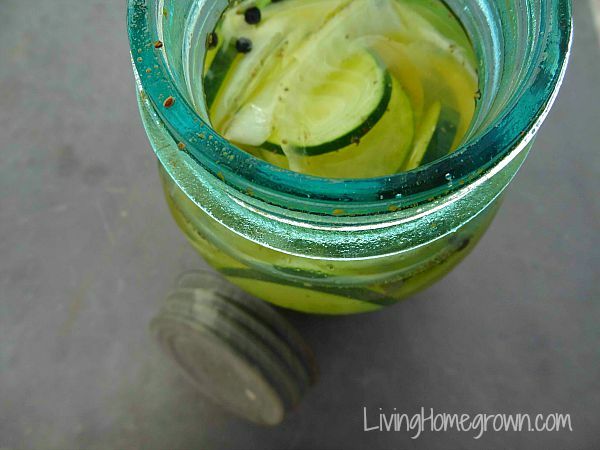 Does the brine need to completely cover the veggies in a refrigerator pickle? 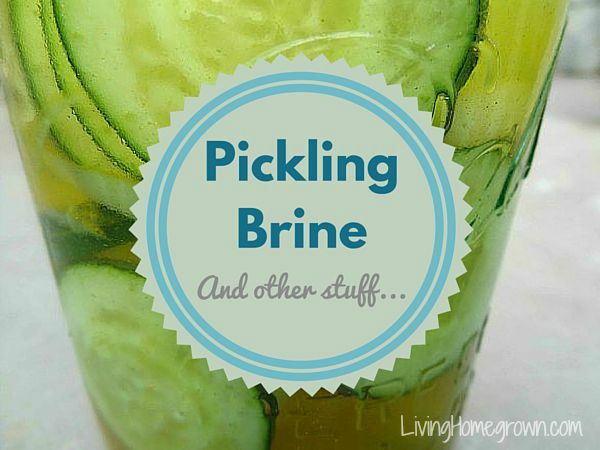 Yes, the brine does need to cover the cucumbers in a refrigerator pickle. With other forms of canning where the jars are processed, you have a vacuumed sealed environment after processing. That means that if some of your veggies are sticking out of the brine in a sealed jar, they are protected and preserved because of the vacuum seal. However, with quick pickles, there is NO vacuum seal. In order for the cucumber to be preserved and to get all of the wonderful flavors and crispness, the veggies need to be under that brine. Now if your cucumbers are floating at the top of the brine that’s perfectly okay because they will absorb the brine by being in contact with the brine. Mostly you just want to make sure that you don’t have cucumbers sitting above (and completely out of) the brine. Can I use sea salt instead of using a pickling or kosher salt in a refrigerator pickle? Yes, you can use sea salt for refrigerator pickles. You might get a bit of clouding, but they would still be perfectly safe. In my particular pickle recipe, the salt is really just there for flavor and helping with the crispness of the pickle. It’s not there for safety so it’s no problem to substitute a different salt. The key is to ensure that the salt is iodine free and has no anti-caking agents so you don’t wind up with a cloudy brine. 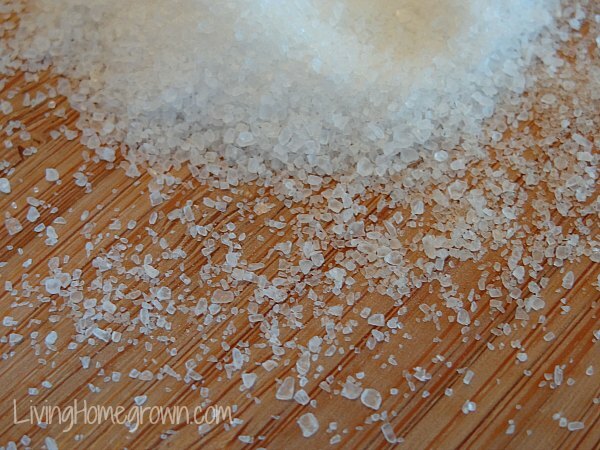 In Cathy’s question, she mentioned that she used a pure sea salt without these additives. So that was a perfect choice. I have a whole post on pickling salt which you can refer to if you want more details on different salts for pickles. I prefer using pickling salt for quick pickles because it gives a crystal clear brine. Kosher salt is my second favorite (as long as it has no anti-caking agents), followed by sea salt (again, ensuring no anti-caking agents). I do want to mention that in some other types of pickling, the salt is very, very important for safety. And when the salt is in a recipe to keep the pickles safe from things like botulism, you have to be careful about substituting other types of salt. In those situations, the best way to avoid that is to substitute by weight. But I wanted to mention it so that no one thought salt substitutions is a universally, easy thing to do as it is in this particular case. You have to look at each recipe individually to make that decision. Do you have any other questions on quick pickles or refrigerator pickles? Do you have a favorite flavor you like to make? I am glad you mentioned the fact that canned pickles do not not have to be completely submerged. I was wondering just that this morning as I was admiring my summer’s canning! There is also a thin whitish film at the top rim of the jar on the inside. Can I assume this is salt/brine that has crystalized on the inside?